Reverse Osmosis is a process which forces a highly concentrated stream of dissolved salts through a semi-permeable membrane into a stream of purified water, known as permeate; and a stream of the removed highly-concentrated dissolved solids, known as concentrate or reject. Water pressure at typical pressure of 200 to 400 psi reverses the natural osmotic tendency of the solution, hence the term “reverse osmosis”. Typically of less than 5 micron rating. Multi-stage simplex or duplex pumps to generate osmotic pressure. membrane housing interconnected with 316 stainless steel pipework. Incorporating pressure gauges, flows, alarms, conductivity measurement and meters. What are Multi-Stage Osmosis Plants? Multi-stage osmosis plants are designed to produce higher-purity water than from a single stage unit. In the multi-stage process, the permeate from the first stream becomes the feed stream for the 2nd pass. The reject from the 2nd pass is then re-cycled back to mix with the incoming feed-water stream. Does the feed-water to a Reverse Osmosis Plant require pre-treatment? The feed water in all cases requires softening, and in most cases chlorine removal using carbon filter and in some cases UV sterilisation to ensure that the feed stream will not scale or foul the membranes. Calculations can be undertaken to assess the scaling potential of the water with special regard to calcium sulphate, calcium carbonate and silica scaling. Treatment can then be advised to make the water non-scaling. This can be acid dosing, anti-scalent inhibitor or, more frequently now, base/exchange softening of the feed-water stream prior to the reverse osmosis unit. With suspended solids present in the feed-water stream, then filtration or ultra-filtration may be required. What is Reverse Osmosis water used for? Reverse Osmosis is commonly used in desalination and waste-water treatment. It is finding increasing use in the treatment of brewing liquor and in low-pressure boiler feed water. Unlike demineralisation, it has the advantage of not using acid or alkali regenerants but it does have the disadvantage of a reject stream which can be typically 25% of the feed water. Unless this water can be re-used, it can add to the cost of the total plant operation. Do the Reverse Osmosis Plant membranes need to be cleaned? b) An organic acid clean. Can Cedek service Reverse Osmosis Plants? We offer a service contract on all water treatment equipment. All of our water treatment service engineers are fully qualified and experienced on the full spectrum of water treatment equipment available.We have defined service specification sheets which define the exact service schedule proposed for a Reverse Osmosis Plant. How do I know what size of Reverse Osmosis Plant I require? Cedek have long term knowledge and history of installing reverse osmosis plants. Contact us and we will help you get the best value and returns for your needs. 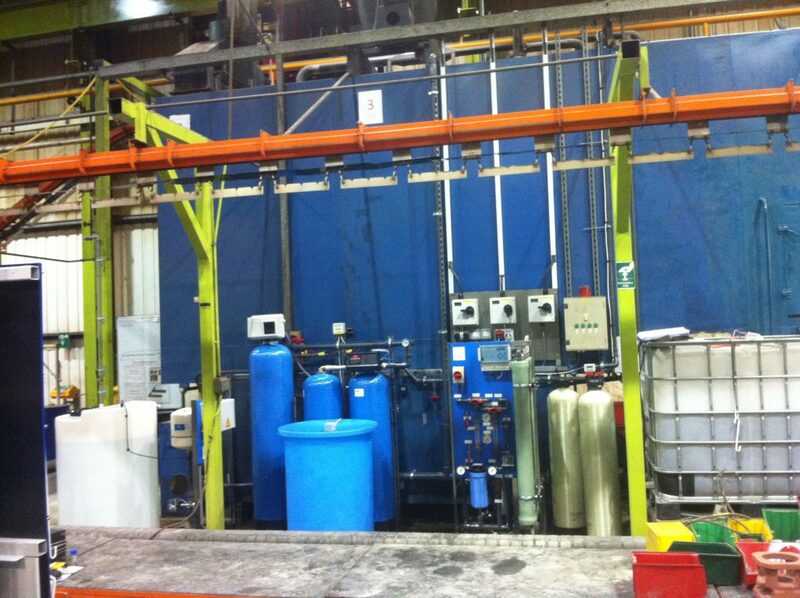 The image shows a paint line rinse water package installed and commissioned by Cedek this plant replaced a 25 year old Demineraliser and has made considerable cost savings for our client in the amount of water used on the paint line rinse. This package is on a bimonthly service contract.